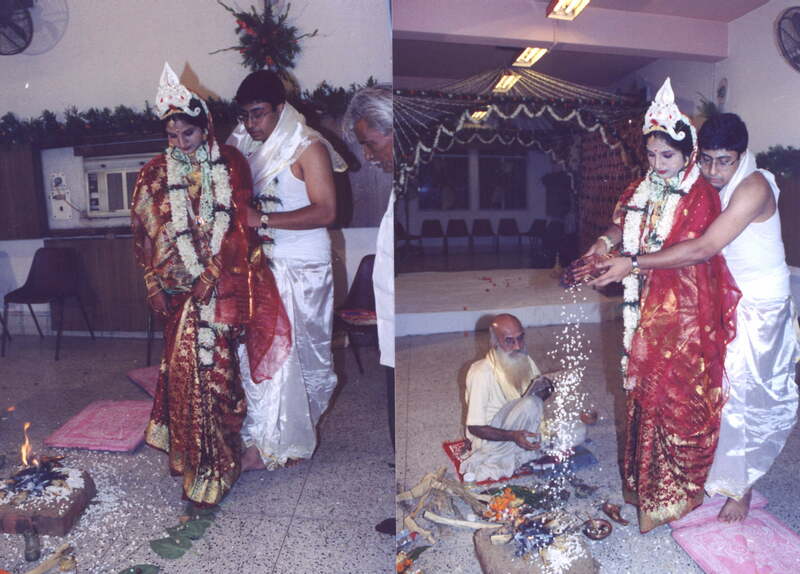 Here the wedding ceremonies are conducted. Two banana trees are placed at the entrance. A big alpana is made with rice paste. The entire place is decorated with flowers and lights. The shehnai (musical instrument like a clarinet) plays throughout. The father and all other relatives of the bride and groom are present A paternal or maternal uncle give away the bride. However, the groom's and bride' s mothers are not present as it is believed that their absence protects the couple from the 'evil eye'. 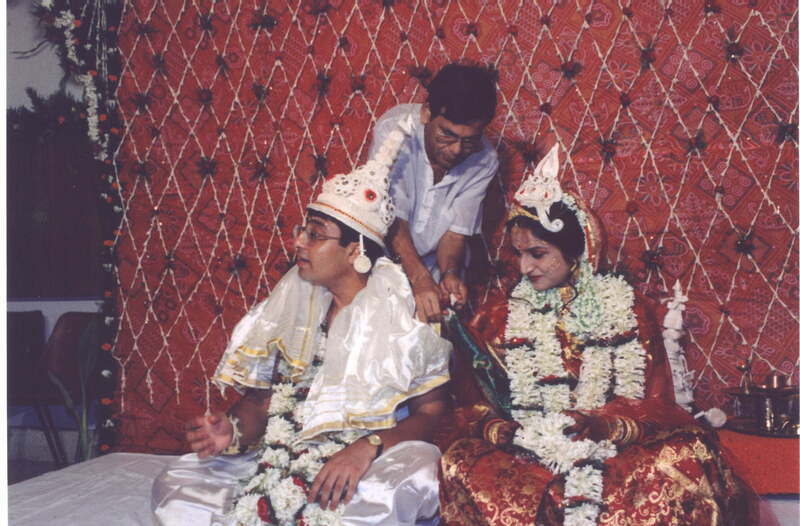 The marriage takes place among much teasing and banter, and the bride is brought to the wedding hut, sitting on a stool carried by her brothers. holy earthen lamp, sprinkling trefoil, and husked rice placed on a bamboo winnow (kula). Then they are served sweets and drinks. 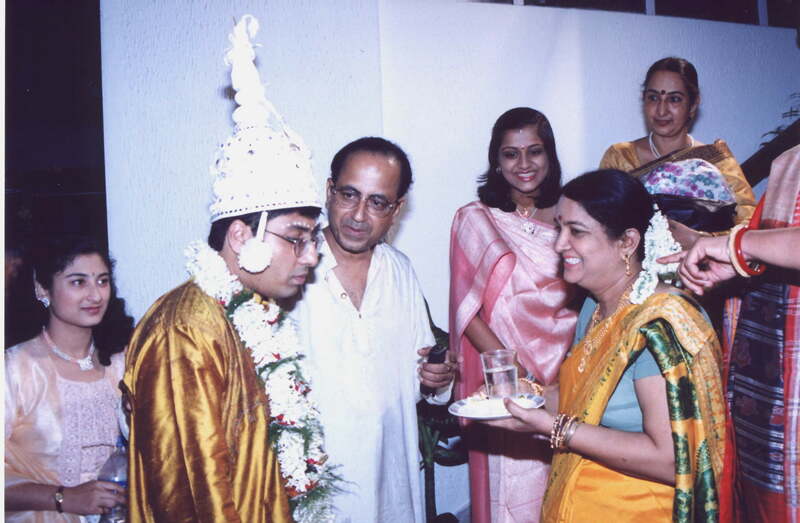 The bride's paternal or maternal uncle hands her over to the Groom. offered sweets and sharbet. Water is poured on the doorstep as the Groom steps into the house. 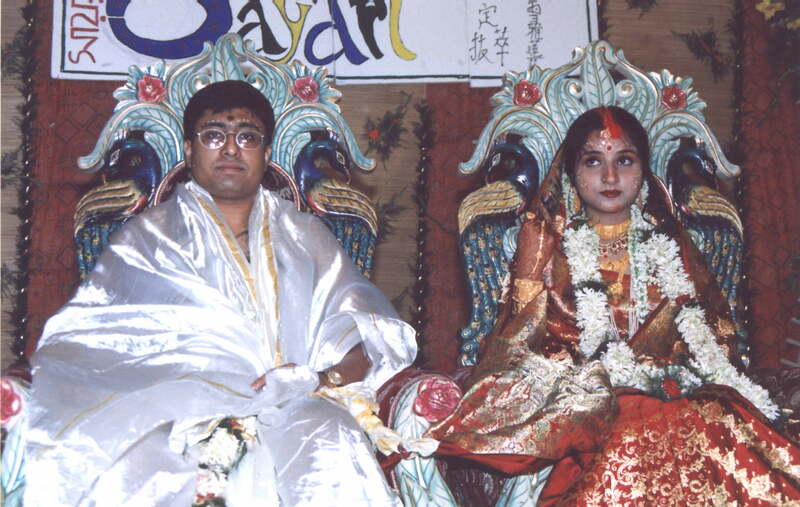 The bride, usually seated on a low wooden stool called pidi is lifted by her brothers.Her face covered with a betel leaf and is carried seven times around the groom.The significance is they are winded up securely to each other. The bride and the groom are made to look at each other in front of all the ssembled invitees. 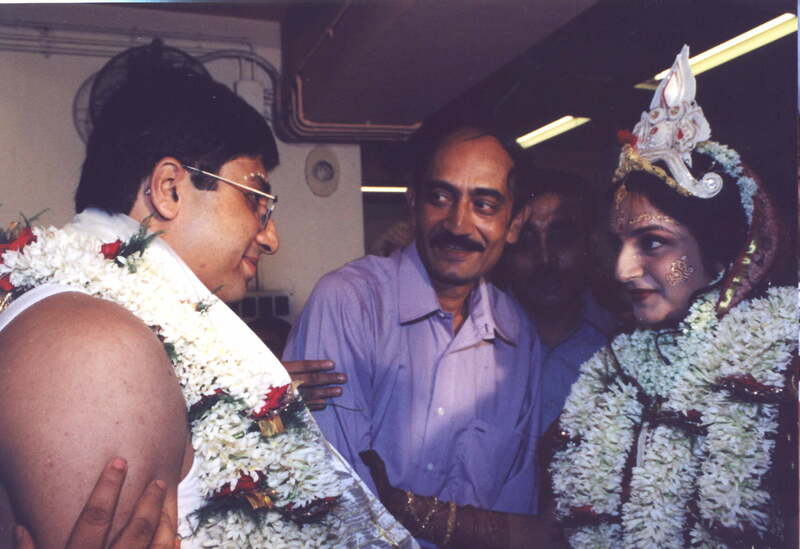 This exchange of loving glance is to initiate them to be together officially by the society. After the circles are completed, still sitting high on the piri, the bride and the groom exchange garlands of fragrant flowers thrice. This is the first step in which they accept each other. 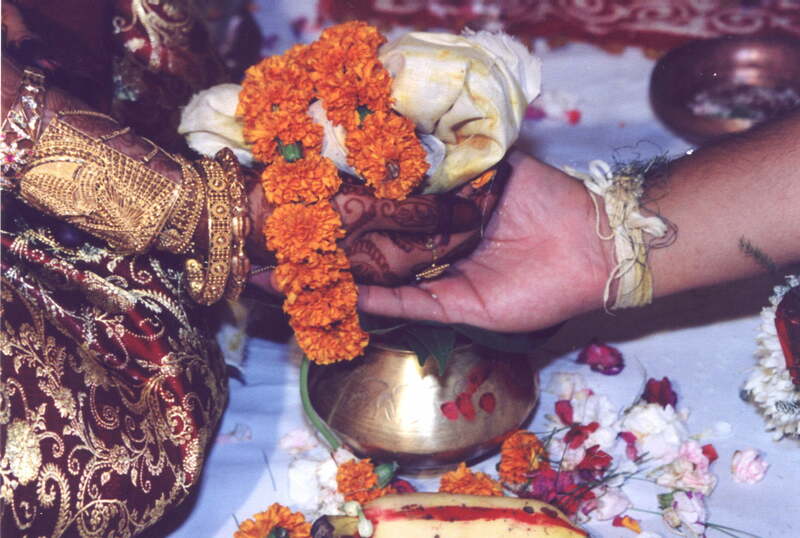 The couple's hands are bound by the sacred thread amidst recital of Vedic chants and are placed on the mangal ghot - a brass pitcher filled with water that is covered with mango leaves attached to one twig and a green coconut placed on it. 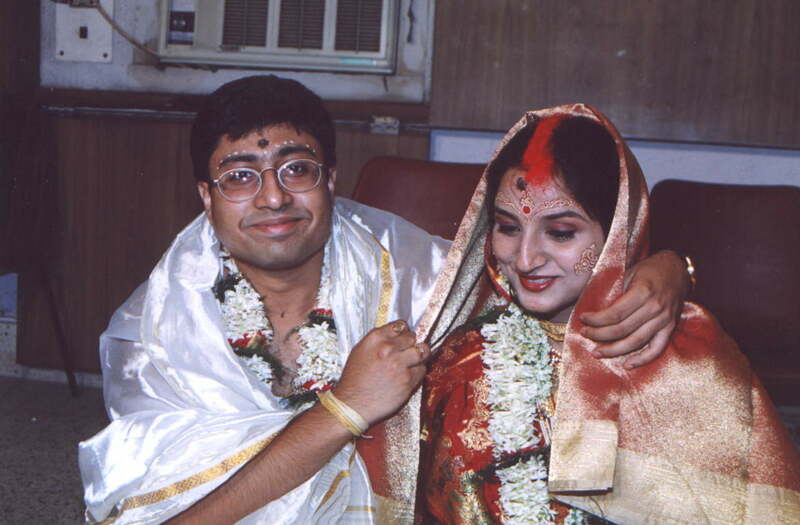 The saree of the bride is tied to teh shawl of teh groom.this signifies their bond for ever. these cloths witht he knot is preserved till one yead after the marriage. 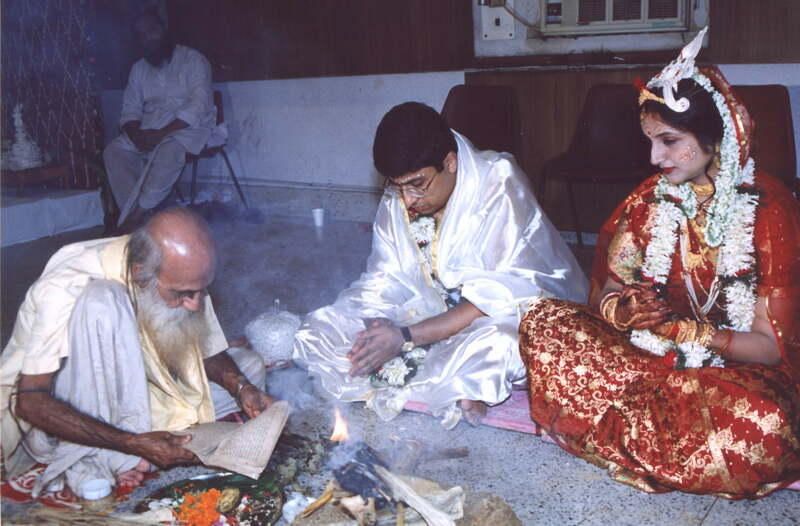 The bride and groom sit in front of the sacred fire and chant mantras after the priest. Agni, the fire god is made the divine witness to the marriage. 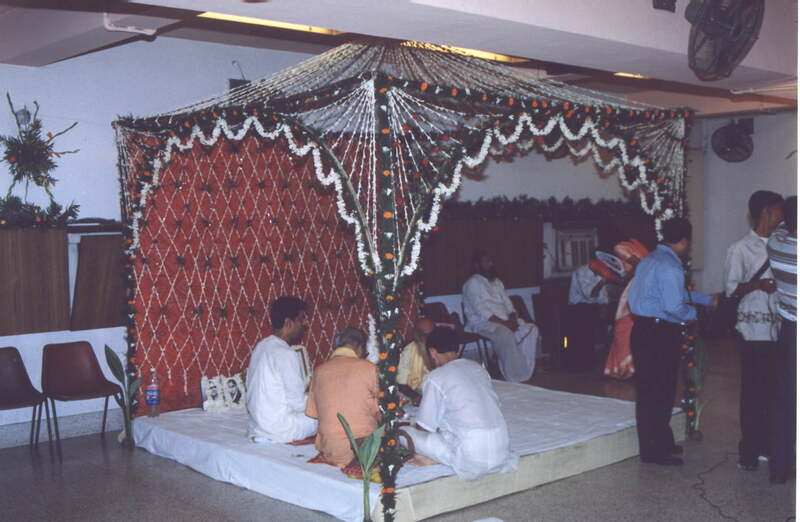 Saath Paak - Seven circular rounds are taken by the couple around the fire thereby solemnizing the occasion. Khoi Daan - An offering to the fire is made. 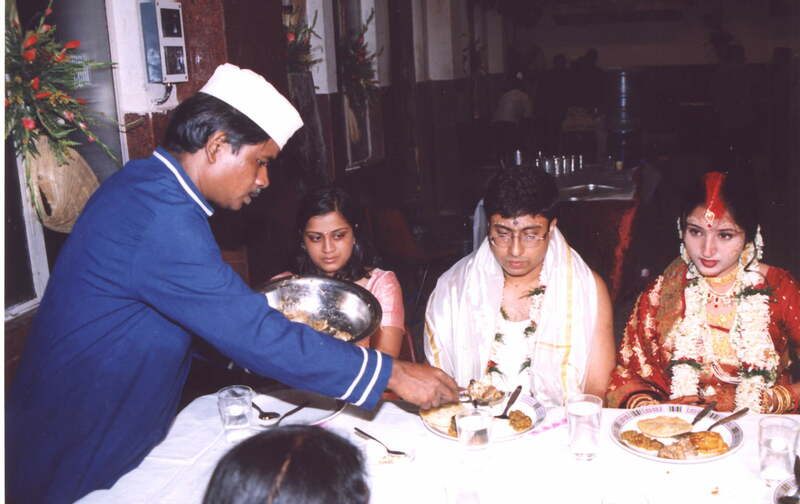 The bride's brother puts puffed rice (khoi) in the hands of the bride, and the groom standing close to her holds her hands from the back and extends their arms forward. They then pour the offering into the fire together. 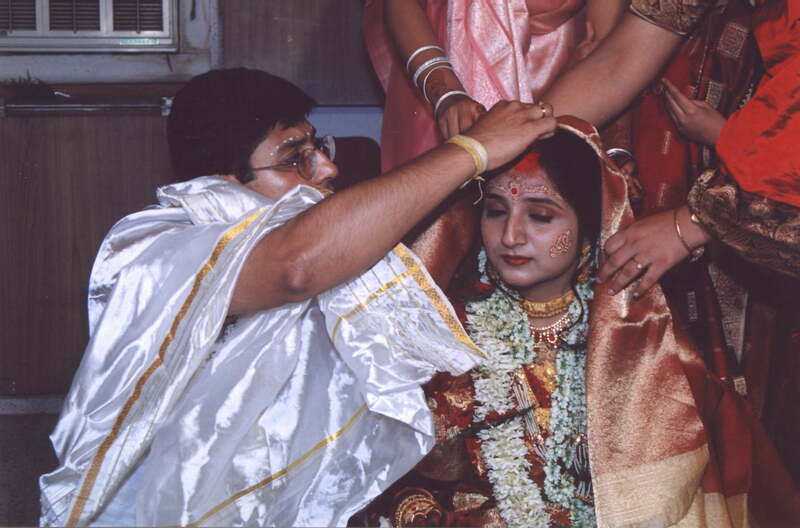 Once again seated at their respective places in chadnatolla the groom applies sindoor or vermilion (a symbol of marriage worn by Hindu women thereafter) on the bride's hair-parting. 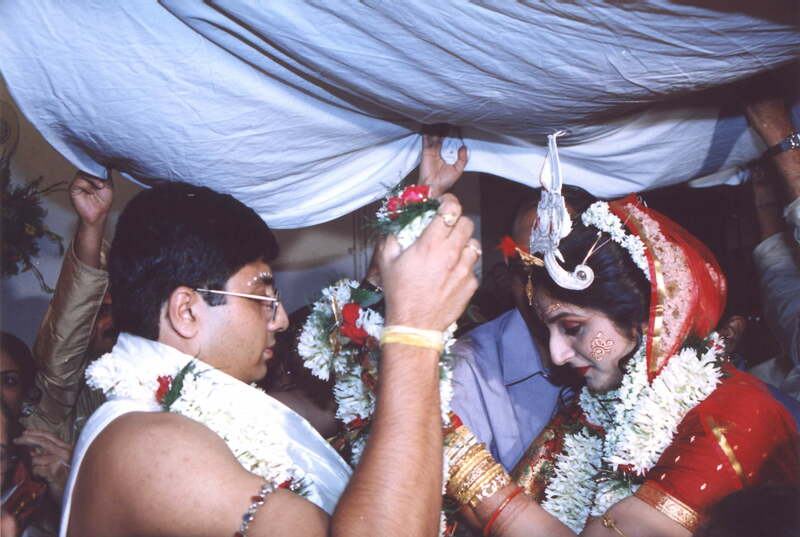 The bride then covers her head with a new sari offered by the groom as ghomta or veil. The red implies passion, fertility and strength.With this, the marriage is complete but the ceremonies aren't. We as newly weds !!! The wedding feast is a lavish affair. Dry fruits are often included in rice dishes.Earlier meals were served on leaves and people would sit on the ground to eat, while family members served them. Today however caterers have taken over, and the choicest fish dish and mutton dishes find their way on the table. 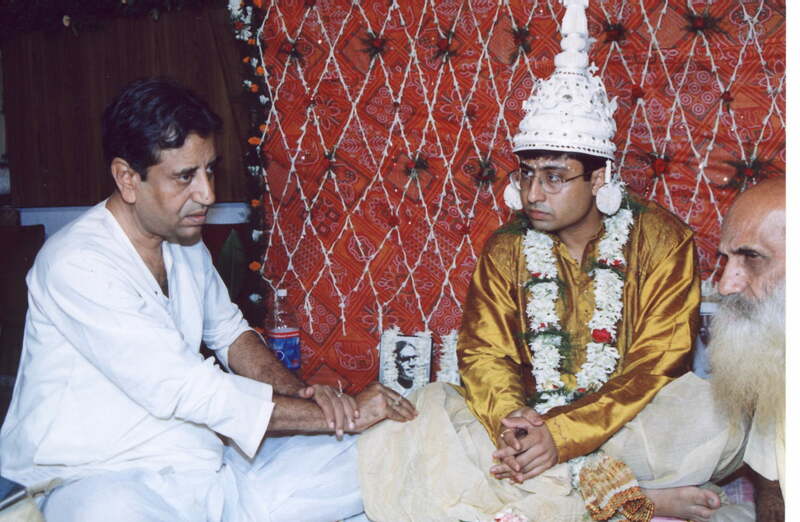 A special dish is made for the groom, Bengal gram Dal, cooked with shredded coconut, and the head of a fish! This is a speciality meant for him only, mainly to recover his strength from all that fasting. Accompaniments are always a mix of sweet and sour. The boy then spends the night after the marriage in the bride's home (though not with her! 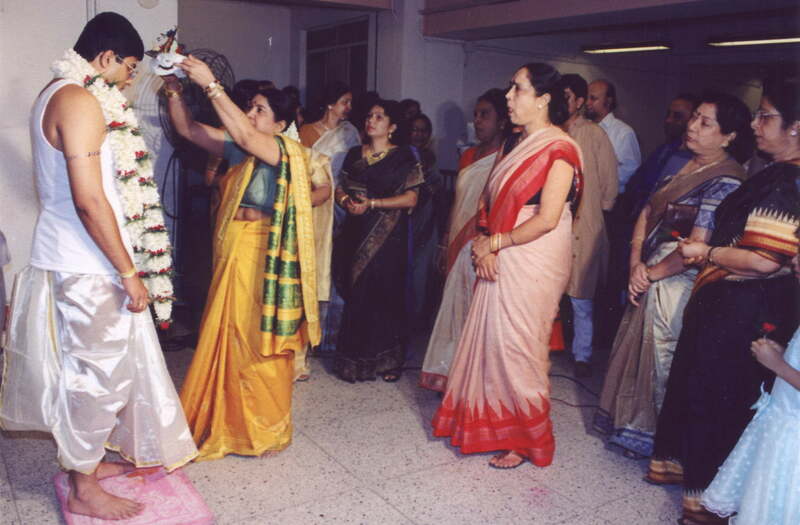 ), and it is followed by the vidai in the morning.